According to Product Manager Kax Uson in Schibsted’s Messaging Team in Barcelona, the future looks bright and shiny for women in tech. What sort of tech projects have you been working on? I’m with Schibsted’s Messaging Team in Barcelona. Right now we are building a Messaging Center which is a global service that we are aiming to be used by all our classified sites. So far it’s being used by three Schibsted sites already and we’re preparing to roll out to three more for this quarter. We want to be able to help make the communication between our users faster, easier and of course, safer, and eventually reach a sale. It’s been nothing but exciting so far. And I work with such amazing people so it’s a lot of fun too. What made you choose a career in the tech field? Why did you decide to work in Schibsted Media Group? I used to work at Schibsted Media Group’s market place in the Philippines called AyosDito.ph and I had one of my best work experience there. The culture was great and I’ve had a lot of fun working with the people both in AyosDito and people from other local sites, as well as with some people in the Central team here in Barcelona. When the opportunity came to work with the Central Team I jumped at the chance expecting the same amount of fun and challenge that I’ve had while I was with the local site and I haven’t been disappointed yet (I don’t expect to). What are the advantages of working in Schibsted Media Group? Getting to work with people from all over the globe — and being able to share experiences, information with each other, for me is a huge advantage. You’re not limited to the context of the country you’re in. What could Schibsted do to attract more women in tech positions? I think it depends a lot on the context. The Schibsted sites in Asia have a pretty good ratio of women in tech positions and tech leadership positions. And I didn’t realize that this is an actual issue until I came here. I think it’s important to understand the circumstances that are working against having women in tech positions in the country that we’re operating in first, and see what we can do to change that. For example, in a country where women are normally paid much less than men: It shouldn’t be the case for a Schibsted company. Or in a company where discrimination against women is normal; for instance, they don’t get promoted to a leadership position? Not in a Schibsted company. And then there are the little things: University recruiting events? Send in the women cavalry! Have them do career talks to high school students about to choose their degree in university. Let them speak about how cool it is to be in this industry. Support events or organizations that encourage women to code. If there’s a foozball table in the kitchen that mostly just the men enjoy, what are you giving to the women so that they can de-stress in the middle of the day too? Private rooms for mothers who still have to pump breast milk but have to come to work because maternity leaves in their country are just 60 days? Yes please! Encourage the women who are in tech roles in the company to speak up and share their experiences. 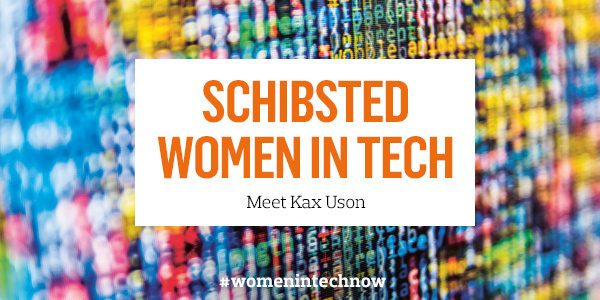 Write about their experience as women who happens to do tech within Schibsted and publish it. Or join organizations that support and encourage other women who also happens to do tech work. Put these women in the frontlines and have them share their voices with the outside world. What does the future look like for women in the tech field? Bright and shiny! Like I said, I’ve been lucky enough to have worked in tech organizations wherein there is a good number of women in tech and tech leadership positions. My professors back in university who taught me computer science were women! The future is now, right? I’m just looking forward to the day when women working in tech positions is not a big deal – just normal.